There's a lot of sweet stuff on the internet--but these are some sweet things we've got to share! 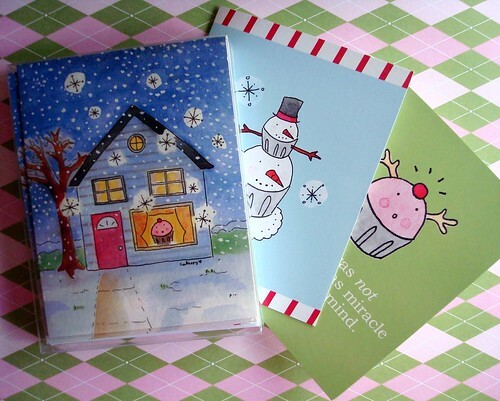 It's never too early to get started--get your Christmas greeting cards at cakespyshop.com! Where in the world is the closest bakery? Contribute by adding your favorites to the Cakespy Bakery Map on Google! We're slowly but surely updating it with places we've visited. If we did this right (fingers crossed) anyone can contribute! Wanna be the big cheese? Deck yourself out with the cheesecake head. "Cupcakes" a more popular search term than "financial crisis"...maybe that's what got us into this mess? Adorable halloween-themed felt cupcakes by Merry Moon Designs. A reason to go vegan: PETA urges Ben & Jerry's to use human milk. In Baltimore, a mobile cupcakery emerges with Perfect Cupcakes. Celebrate Banned Books Week, sweetly, with Haphazard Gourmet Girls. Sandwich Cookie Smackdown: Not Martha does a taste test with Oreos, Hydrox and Newman-O's.